Math is hard – just ask The Washington Post. 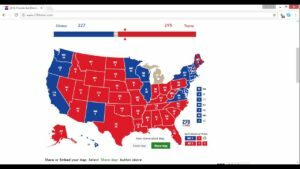 The Post’s pollsters came to the conclusion that it was mathematically impossible for Donald Trump to get to the 270 electoral vote threshold. “Trump’s path to an electoral college victory isn’t narrow. It’s nonexistent,” read the Post’s Oct. 18 headline over an article written by voting analyst Stuart Rothenberg. But the Post was not alone in its inability to do the math. As the polls were closing on Nov. 8, the New York Times gave Hillary Clinton an 80 percent chance of winning. “Everybody around elites — namely other elites — were saying Hillary was going to take it,” Matt Briggs, a teacher of statistics at Cornell University said. Larry Sabato said 90 percent of polls fed into his previously-celebrated “Sabato’s Crystal Ball” were wrong. The biggest goofs were in polling for the states that tipped the scales in Trump’s favor. Wisconsin: More than 30 national polls said Clinton would win the state by 4 to 15 points. Trump won by 1 point. Pennsylvania: All national polls said Trump would lose. He won by 1.2 percentage points. Michigan: Every national poll had Clinton winning by 4 to 10 points. She was trailing Trump by 0.3 percentage point with all precincts reported. About the only polling firm to actually get it right was the little-known Trafalgar Group in Atlanta. “Trafalgar Group and its seven employees discovered during comparison polling that some Trump voters would not disclose how they planned to fill out their ballots,” Rowan Scarborough wrote for The Washington Times on Nov. 9. “After all, the liberal news media and Clinton had labeled Trump followers as deplorable people. Trafalgar predicted Trump would win Pennsylvania and Michigan and also nailed results in North Carolina and Georgia and predicted a Trump win in Florida. It also said Trump would receive 306 electoral votes. He is likely to end up with that exact number. “We knew Monday night that Trump was going to win,” said Robert Cahaly, the group’s senior strategist.